Hey guys! I am so incredibly excited to share my latest sweater pattern!!! It's for a good ole' Varsity Sweater. 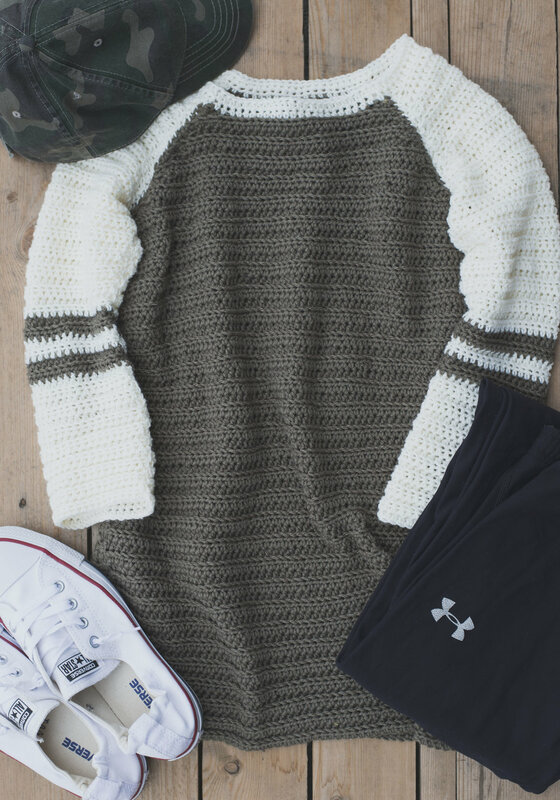 :) I have been wanting to crochet a "baseball tee" (what I usually call these types of shirts) for what seems like forever. I love the simplicity of them, with their raglan-style sleeves. Despite the intimidating sleeves, this sweater is actually quite an easy make. It features a cool ribbed stitch, made up of hdc's. The pattern is written for sizes XS-XL, and is designed to be more fitted. If you'd like a bit of a roomy sweater, I'd size up for sure! So when planning this sweater I was really inspired by this baseball tee I saw on Pinterest (see here). Once I saw it, I realized I had to make a crocheted version! I love the olive-y taupe color I did it in, and once I finished mine, my brain was swirling with all the color possibilities you could do with this sweater. I think it makes the perfect casual top.. great for football games, am I right? Anyways, I hope you like this pattern. I worked extra hard to make it clear and easy to understand. Please be sure to read all the notes below before starting!! -yes, the hook is larger than what's recommended for the yarn weight-it's on purpose! First you will sew up the sides of the two body pieces. Lay RIGHT sides together, and make double sure to align the “stripes”, or rows, of both front and back pieces -- this is very important. Then pin the sides with sewing pins to keep secure while you sew. 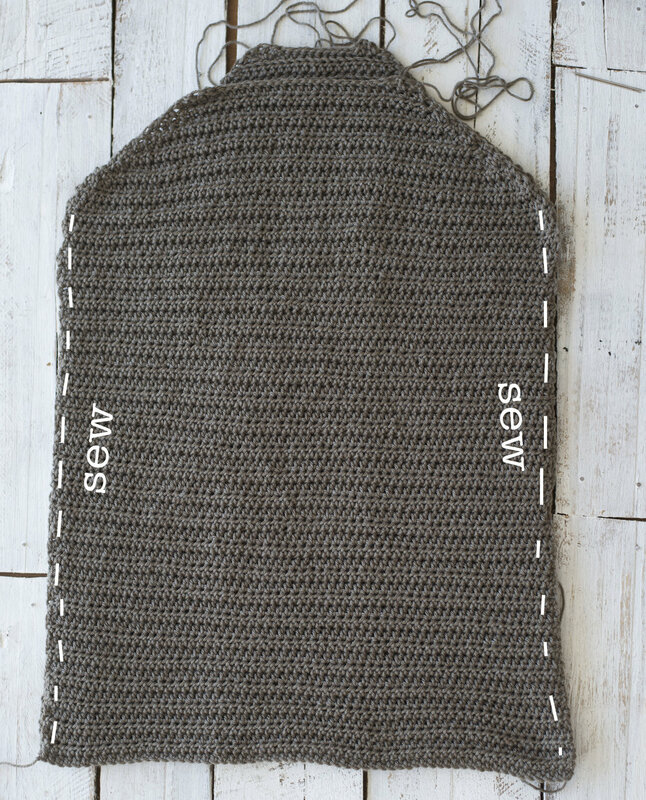 Sew up the sides of the body pieces along the very edge of the two with needle and long piece of “color A” TO ROW 49. Double check as you sew along that you are still matching up the stripes of both pieces. Also be sure to not sew too tightly. After both sides of your body pieces are sewed, you will move on to the sleeves. Above you can see a photo of how to tell the difference between the different sleeves, and the front or back side of the sleeves. The back side is a bit longer, and has less of an angle. The front is shorter and has more angle. In the photo above, you can see how to tell the difference between the right or left sleeves, as well as the front or back side of the sleeves. The back side is a bit longer, and has less of an angle. The front is shorter and has more angle. Next fold the sleeves in half length-wise (see far right photo), folding so the RIGHT sides are on the inside. Also, like on the body pieces you are going to align the stripes (or rows) together-- VERY IMPORTANT, and pin to keep secure. Then using strand of “color B” and yarn needle, sew along the open edge (very edges) up to row 35. Make sure not to sew too tightly. Next you will be attaching the sleeves to the body piece. *Remember which side is which when it comes to the sleeves. Turn both the sleeves and the body piece RIGHT side out, then you are going to first align the seam of the side of the body with the seam of the sleeve placing the RIGHT sides against each other (this is the armpit) and pin to secure. Next you will align the very most tip of the back body panel with the very most tip of the back side of the sleeve. And pin to secure. Then you will align the edges of the body and sleeve from the tip of the back side you just pinned to the seam (armpit) pinning along the way. The front side has a little slack in the sleeve, but if you evenly distribute it as you pin it to the body it will will work out just fine.. you don’t have to worry about lining up the “stripes” on the sleeves. Then using your yarn needle and strand of “color B” you will sew along the very edges, attaching the body to the sleeve. **I used a “back stitch” and made sure not to sew too tightly (important). After all ends are woven in, your varsity sweater is complete! Whew! 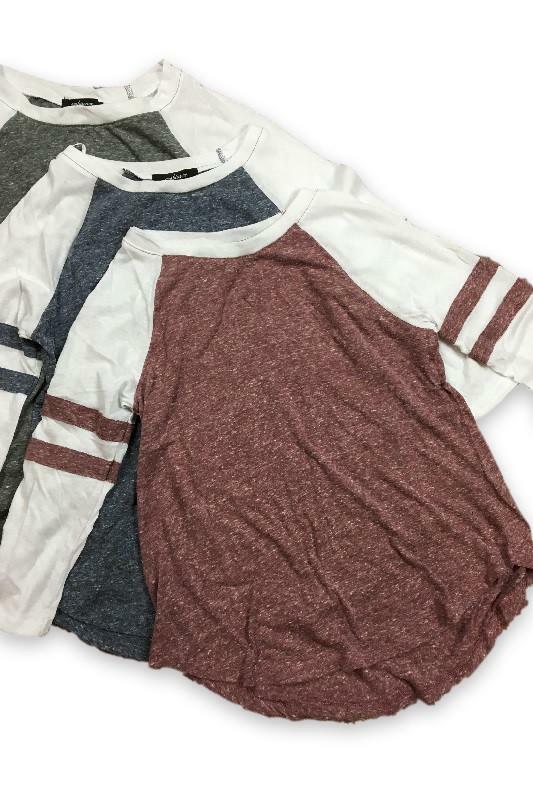 And that... is how you make the coolest ribbed raglan baseball tee. I really hope you make this bad boy-- it's a little bit more work, assembly-wise. But man, it's so worth it. It's such a cute sweater, and it feels so good to say, "I made this". As always, do PLEASE share your finished project with me over on Instagram. Pretty please. It always brightens my day to see your version of my patterns! Feel free to leave any questions/comments below and I will get back to you ASAP.